White paper on crime 2004 Part4/Chapter2/Section6/2. Fig. 4-2-6-1 shows the number of juvenile probationers and parolees newly placed under the supervision of probation offices since1949. The number of juvenile probationers newly placed under the supervision of probation offices increased drastically since1977when short-term probation for traffic offenses was introduced.It remained at around70,000since1983but decreased from1991until1995.Although it increased slightly from1996until1998due to the implementation of short-term probation for regular offenses introduced in1994,it has decreased again since1999to44,207in2003,a decline by4,436(9.1%)from the previous year.Breaking it down by type of treatment,20,435juveniles were placed under short-term probation for traffic offenses(down by2,899or12.4%from the previous year),4,654were placed under short-term probation for regular offenses(down by129or2.7%),and19,118were placed under other types of probation(down by1,408or6.9%). 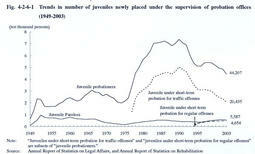 The number of parolees from juvenile training schools had increased until1985,due partly to the introduction of short-term treatment programs in juvenile training schools in1977.After that,it generally decreased until1996but increased from1997to2002.In2003,however,it decreased by261(4.5%)from the previous year to5,587(see Appendix2-13 ).